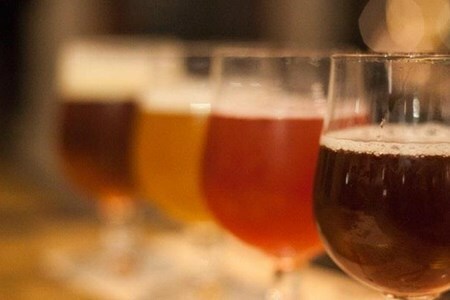 On this craft beer tour in Hanoi, Vietnam you will have the chance to taste up to 12 different craft beers, delectable finger foods with beer pairings along the way, and round-trip ... moretransportation from your old quarter hotel. 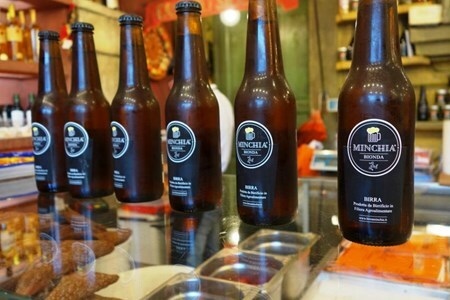 You will have an exclusive look into how one of Hanoi’s local craft beers is made with a brewery tour. 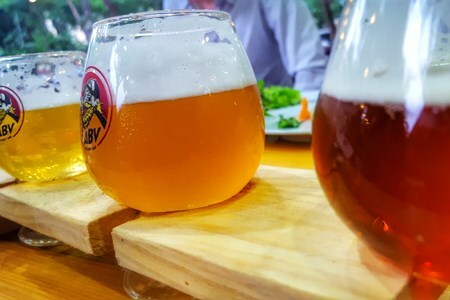 Whether you’re a light beer person or connoisseur, this Hanoi craft beer tour provides a safe and comfortable way to visit Hanoi’s top spots. 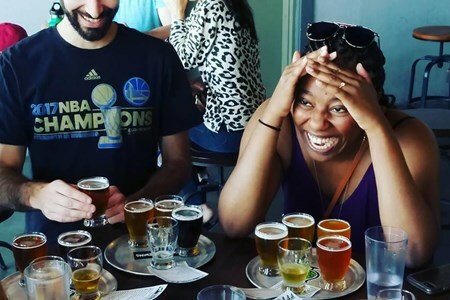 From Pilsners to Stouts, our beer guides will introduce you to award-winning beers of all styles. Book a one day wine tour from Plovdiv with us and get a taste of the uniqueness of the Plovdiv area, enjoy the local wine, discover the local grape varieties, learn about the history ... moreof the area and, most importantly, have an unforgettable day. Welcome to your Bulgaria wine and food adventure! A private tour leader will be waiting outside your place of accommodation in the morning to pick you up, and transport you to your first destination: a high-quality winery just outside Plovdiv. At each winery, a representative will meet you and welcome you into the winery. The representative is the winemaker, the owner, the manager or the onsite wine tourism manager. Your winery tour will typically follow a 'grape-to-bottle' approach starting with a visit or talk about grape cultivation and vineyards. The wine route continues into the wine cellar, where you will learn about harvest and wine production. In the barrell room, you will understand the process and meaning of ageing wines. The winery tour ends in the tasting room with a tasting of 5 wines from the cellar (white, rose and red) accompanied by mineral water and local appetizers. The winery representative will lead the tasting, and answer all your questions. 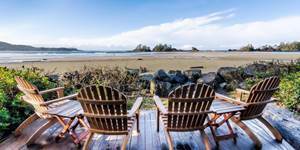 Three very differernt wineries will be visited during your full-day excursion. Between winery visits, a traditonal lunch will be served. Your tour leader will be happy to introduce Bulgarian culinary specialities. Your meal promises to take your taste buds on a tour of Bulgaria's most local and authentic favors. Wine will be available to purchase at each cellar at favorable cellar-door prices. At the end of the day, your private tour leader will drop you off at your place of accommodation in Plovdiv. Food, Wine, Culture. Experience the best-kept secrets of Bulgaria's Wine Country! 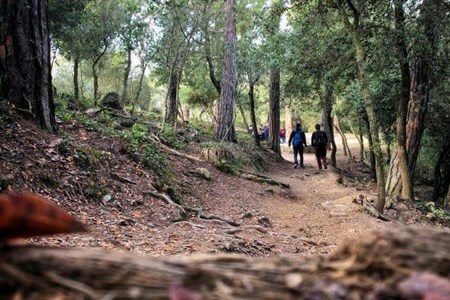 Discover an incredible natural area in the outskirts of Barcelona on a half-day hike through Barcelona’s green lung, the Collserola Natural Park, followed by a truly authentic Catalan ... morelunch. From Plaça Catalunya we'll use a clever combination of public transportation (train, funicular and minibus) and will soon arrive at the top of the spectacular Mount Tibidabo. From here you can admire the views over the entire city of Barcelona and out to the sea. After spending some time taking in the impressive vistas, we’ll take a few minutes to visit the beautiful Templo del Sagrado Corazón de Jesús (the Temple of the Sacred Heart), which was built between 1902 and 1961 and is right at the peak of Tibidabo. Once you’ve had your share of the amazing city views, we’ll leave the bustling metropolis behind and your guide will lead you into the tranquil natural park of the Collserola. The 1.5 hour light hike through the forested trails is easy and extremely pleasant. It’s hard to imagine that you are so close to a huge city! Along the way you’ll learn about the flora & fauna of the area, as well as about the history and culture of Barcelona, Catalunya and Spain. We’ll pass under the Torre de Collserola (the Collserola Communications Tower), which was built for the 1992 Olympics and is the highest “building” in Barcelona, at 288 meters (945 ft.) high. Your guide will be equipped with delicious snacks to be enjoyed at an interesting stop along the way. At the end of our trail, we’ll come across a restaurant housed in a traditional 16th century masia (stone farmhouse) where we’ll enjoy a fantastic lunch of classic Catalan fare. 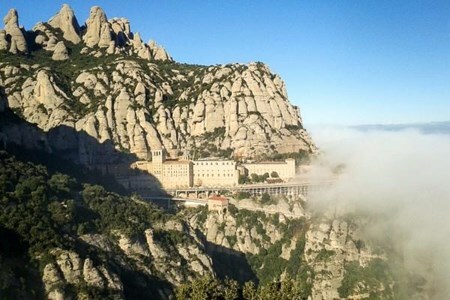 One more chance to keep learning about local culture, while enjoying the food, the wine and the views (all the way to Montserrat, the “serrated mountain”, if the weather is clear)! Lunch will be followed by a short and convenient downhill walk to the rail station, where we’ll catch the train that will take us directly back to Plaza Catalunya in just 20 minutes. Magic! The price of this all-inclusive half day tour is 70 EUR / person for a small group tour where there could be up to eight guests in total along for the day. Included in the price are the public transportation fees, a very knowledgeable and personable, English-speaking guide, a great restaurant lunch, snacks during the hike and bottled water. There would be a surcharge of 15 EUR / person if you end up being the only two guests on a non-private day trip. Although this is not likely (especially during the months of April through October), it would be necessary in order to cover the guide fee and expenses that would normally be covered by having more than two guests on the trip. We do not cancel our tours if we don't reach a certain minimum, but we do charge this minor surcharge if we end up with just two people. After picking you up from our central meeting point at 8:30am, we'll drive 1h 45m to the incredibly beautiful and rugged Priorat wine region, with it's steep hills covered from top ... moreto bottom in craggy vines. First on the agenda is a visit the tiny village of Morera de Montsant to take in the stunning views at the foothills of Montsant. From here you will be able to get an overview of the entire region and your guide will give you a bit of an orientation. Afterwards, we'll duck into a small winery for a three-product tasting of terrific Priorat wines. The next stop is the village of Gratallops, where we will head for a private tour and tasting at the renowned Clos Figueres winery and estate. This winery is run by Christopher Cannan, who is known for being one of the first in the region (along with Alvaro Palacios, Rene Barbier and Josep Lluis Perez) and is quite a charming character. Their wines are produced with their own grapes from old vines, without watering the vines and without using insecticides or any other synthetic products. While there, you'll enjoy a fantastic, traditional lunch in the winery. After lunch, we'll drive to the tiny village of Porrera to meet with Paco Castillo-Serrano of the family-run Clos Dominic winery to tour their beautiful vineyards and taste their fabulous vintages. This old-vine vineyard (with many vines over 100 years old) was purchased by Paco and his wife, Dominic, in 1998 when they began to fulfill their dream of creating their own wines. 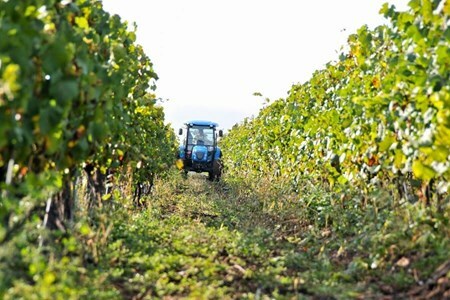 To this day, they manage and harvest their vineyards with help only from family and friends. Once we finish our visit and tasting with Paco, we'll begin the drive back to Barcelona, arriving to the city around 7-8pm. This price of this all-inclusive small group day trip is 190 EUR / person. Included in the price are transport in one of our modern touring vans, a very knowledgeable and personable, English-speaking guide, a great traditional lunch, and generous wine tastings at three fantastic wineries. This day trip is more expensive than our D.O. Penedes tour because the Priorat region is much more exclusive than other Catalan wine regions and as a result, the winery visits and meals are more expensive, as well. Winery visits and tours are always private and are nearly always attended and/or led by the wine maker. Additionally, as you may already know, the wines in this region are more expensive due to the extremely harsh growing conditions, low-yielding vines, and harvesting carried out by hand, which is very labor-intensive, but the wines...and the day...are well worth it! 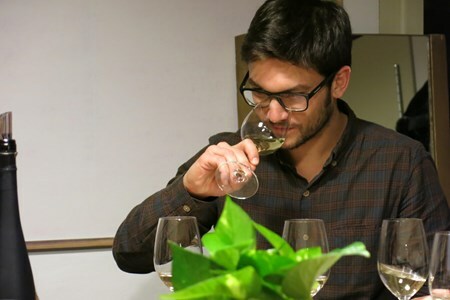 This day trip is fun, informative and educational, as well as a very unique opportunity to try a variety of fabulous wines and cavas (which are Spanish sparkling wines) and have a ... moregreat meal in an amazing environment. We visit two small vineyards in Alt Penedes, which is the upper part of the Penedes wine region, about 40 minutes southwest of Barcelona. Alt Penedes is known for its smaller-batch, more specialized wines, and these vineyards are no different. The morning stop will consist of a brief tour, as well as a presentation of the region and wines, followed by a 3-product tasting. Next we'll drive a short distance to the second vineyard, where we'll begin with a short trip out to the fields for a brief history of the wine region, the grapes grown here and the processes used, then we'll go into the facilities and down into the cellar for an explanation of the equipment used to elaborate the wine, the storage processes and the bottling methods. Afterwards, we head to the tasting room for very generous tastings of white, reds and a reserve cava. All of this is enjoyed over a meal of traditional Catalan food...select cured meats and cheeses, olives, tomato salad, bread with tomato and olive oil, and Spanish tortilla (sort of like a quiche). Of course, all that you taste is available for purchase from the vineyards. The price of this trip is 105 EUR / person, departing at 10am and returning to the city around 6pm. Included in the price are transport in a touring van, a very knowledgeable and personable, English-speaking guide, visits and tastings at two small vineyards, a great traditional lunch and bottled water available in the van. Our wine trips are very unique in many ways, one of which is the fact that we only take a maximum of eight people on each trip (as with all of our day trips), ensuring that the day is relaxed, personal, flexible and fun. Additionally, we go to small wineries that are not visited by busloads of people. We are almost always the only guests at these establishments during our scheduled visit, which enables us to have a very special visit, tasting and meal, and ensures that we have the undivided attention of the winemakers for any questions that one might want to ask. Important: There would be a surcharge of 15 EUR / person if you ended up being the only two clients on any non-private day trip. Although this is not likely (especially between April and October), it would be necessary in order to cover the guide fees and other costs that would normally be covered by having more than two clients on the trip. The positive side of the supplement is that you end up getting a private tour at a fraction of the normal private touring price! 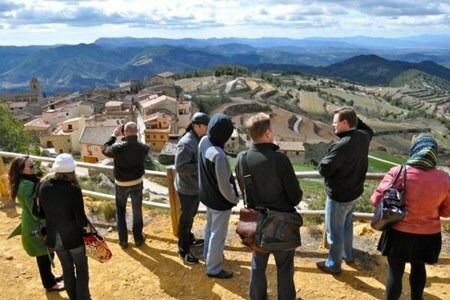 Perfect for those that want wine tasting within Barcelona, creatively coupled with sampling the varied, wonderful cuisine of Spain, this all-inclusive, 4-5 hour wine and food tour ... moreis the answer. 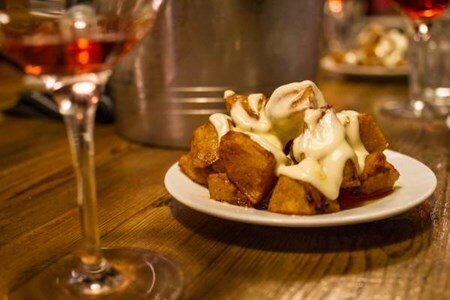 One of our guides leads you through the four main districts of l'Eixample, El Raval, Gothic and Born to local hot spots for great gourmet tapas and a wide variety of wines from around Spain and Catalunya. Wine and food connoisseurs, as well as those who simply enjoy wine, are assured a fun, informative gastronomic experience with plenty of great wine and food, as well as plenty of information from an English-speaking, personable guide about wine, food, culture and the history of the city and region. This is a walking affair with about 15 minutes between each of the four destination restaurants. The tour is about good food, good drink and good laughs for all. Spanish Trails collaborates with only fun, non-touristy establishments which are genuinely interested in keeping the experience unique, fun and memorable. The price of this all-inclusive walking tour is 95 EUR / person for a small group tour where there could be up to eight clients in total along for the tour. 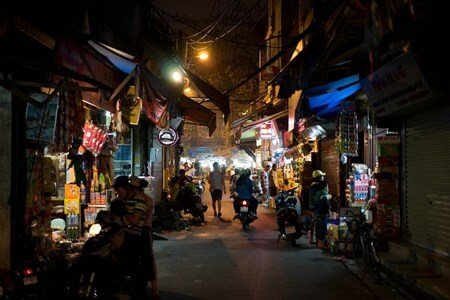 There will be a surcharge of 15 EUR / person if you end up being the only two clients on any non-private tour. Although this is not likely, it is necessary in order to cover costs that would normally be covered by having more than two confirmed clients. We do not cancel our tours if we don't reach a certain minimum, but we do charge this minor surcharge if we end up with just two people. One of the best things to do in Tuscany is to discover Italian food and wine and what better way to so than to go wine tasting in Florence! You will meet locals, taste authentic food and wine and see more of Florence like a local. Our Florence Wine Tasting offers you the opportunity to taste great Italian wines in traditional Italian wine bars in Florence. All wine tasting tours are run in small groups and takes you to wine shops and wine bars of high quality and expert service. 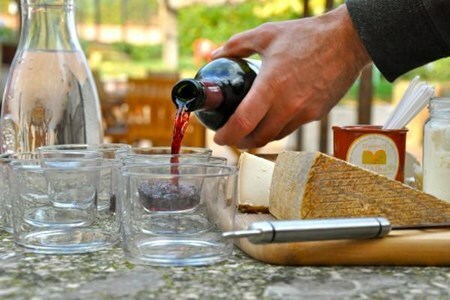 During this Italian wine tasting tour in Florence, your guide will explain what exactly is a Chianti and that the important Italian grape of this region is Sangiovese and will share some useful food and wine pairing tricks! 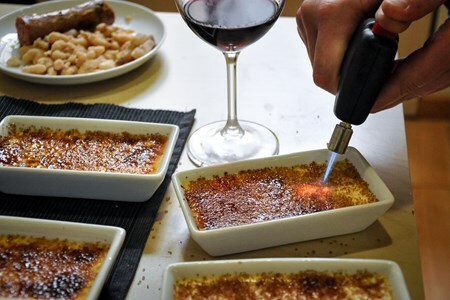 For example, you will taste and understand why a Tuscan wine like a Chianti pairs deliciously with local cheeses and artisan cured Tuscan salami or how perfectly a beef stew is best paired with the wonderful Super Tuscan wines, which are usually a blend between international grapes like Merlot, Cabernet Franc, Cabernet Sauvignon and Petit Verdot. 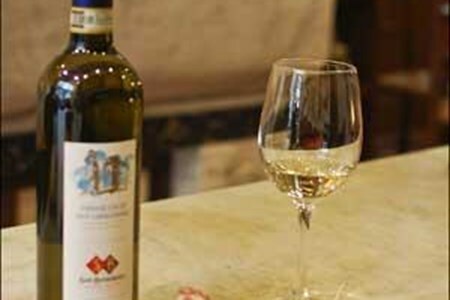 Our Wine Tasting Tour in Florence is the perfect way to taste and discover Tuscany! The Wine Tasting is accompanied by traditional Tuscan appetizers such as Pecorino cheese (made with the sheep milk) and extra virgin olive oil, that is unlike any other olive oil in the country. Florence is nothing if not a feast for the senses. From visually stupefying architecture to the heady aroma of the country’s most delicious culinary offerings, Florence is just as ... moremuch an experience for serious food lovers as it is for European history enthusiasts. Of course, wine tasting and delving into fine dining in Florence is not for everyone. 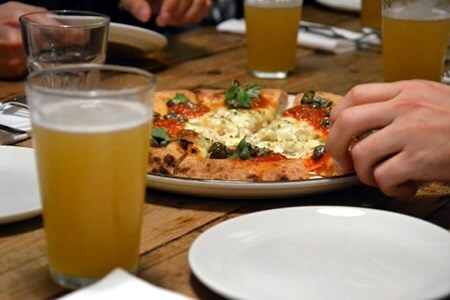 However, with our Florence beers and bites walking tour, we strive to introduce city visitors to some of Florence’s most celebrated local beers and their traditional food pairings. This way, you can come away with as authentic as possible an experience of the city without having to break the bank in order to do so. Centered in and around the Oltrarno quarter of Florence situated just south of the River Arno, our 2.5-hour walking tour guides you around one of the city’s most notable historic areas. Here, you will be able to appreciate such sights as Michelangelo Square and the Basilica of the Holy Spirit. However, our true tour experience will center around casual arrival at some of the Oltrarno areas traditional bars and eateries. 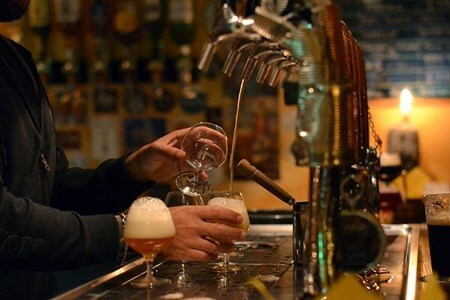 Here and while inspiring you with tales of the area's rich history, our guides will introduce you to some of Florence and Italy is most celebrated local beers and such beers traditional food pairings. A brilliant way to unwind in Florence after a long day of more intensive sightseeing, our guides and the proprietors of the local bars and cafes you will visit will help you appreciate Florence in much the same way that many of the locals do each evening. This Rome Wine Tasting tour will take you through the history of the Roman Countryside. You will learn that during the 70’s in the Lazio region, there were 75.000 hectares of vineyards, much more than what is grown today in Tuscany and Piedmont. Today the Lazio wine region has extended just by 26.000 hectares. Did you know that once the vineyards were in the city centre of Rome, today there are vineyards that still grow in the historical part of Castelli Romani. Our Italian Food and Wine Tasting takes you to an historical Enoteca where you are served three wines that tell the story of the viticulture of the Roman countryside. Two whites and one red will be served with cheese and cold cuts in order to give you some basics for wine and food matching. 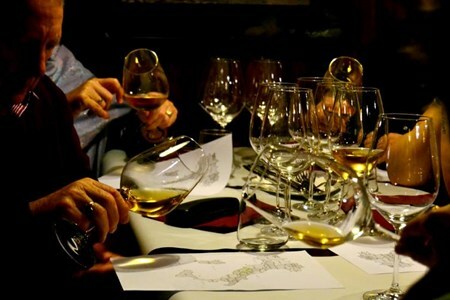 After completing a Wine and Cheese Tasting in Rome with us, you will be able to recognize the differences between colors and flavors as well as be able to recognize the areas where these Italian wines are produced. The capital city of Tuscany and birthplace of the Renaissance, Florence is a terracotta tiled architectural marvel of a city. However, with the city also being something of a gastronomic ... moreand delicatessen sensation, Florence food tours are a must for any serious food lover. Committed to small group sizes, we then adventure out into Florence’s main fashion district and start sampling the city morsel by morsel. From mouthwatering truffle sandwiches to artisan breads, cheeses, salami, wine, and a variety of seasonal specialties, our Florence food tours are designed to dazzle the senses and introduce non-residents to the cities unique flavors and aromas. Stopping to sample the San Lorenzo Market, Florence’s oldest, our guides help you select and taste as wide as possible a variety of local dishes including local Tuscan savory masterpieces. 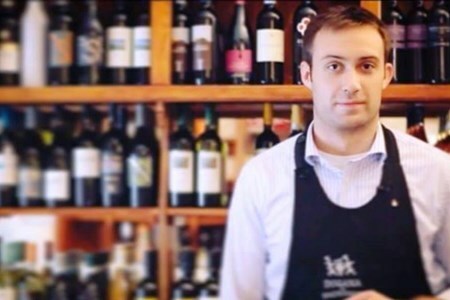 Visiting authentic wine shops, local sommeliers will explain the secret behind local wine colors, perfumes and the local art of basic viticulture and wine making itself. As part of our Florence food walking tour grand finale, we will later finish with a desert of authentic Florentine gelato. A sweet sensation dating back to Roman times when snow would be brought down from local mountains, local legend has it that Florence itself first gave rise to modern ice cream. If you are visiting Florence, our local food tours are the perfect way to absorb yourself in the history and culture of this spectacular city. In this case, make sure not to miss out and book today! Our Food Tour is enjoined by vegetarians and children too. Children 4-10 years old can receive 50% off. 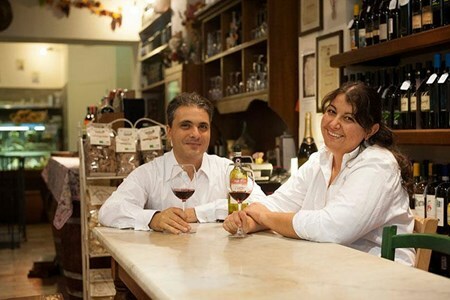 Enjoy a private guided tour combined with authentic local food tastings through one of Florence's most enchanting areas. The private afternoon food tour is the perfect option for families, ... morecouples and corporate teams that are looking for a unique food experience. Our Private Tour really fill you up with freshly made, delicious food and drink, in abundance! Meet up with your personal guide and start visiting the elegant fashion district of Florence, where you will experience a heavenly mouthwatering truffle sandwich: you won’t find anything like that in the world! Your Private Food Tour continues with a visit to a local wine shop where you will taste olive oils and two different wines, where the on-site Sommelier will explain the differences between colors, perfumes and areas where wines are produced. No food visit to Florence would be complete without an authentic “piatto di pasta”, local “crostini” accompanied by a glass of wine, an Italian pastry and coffee, which is made with a blend of carefully selected coffee beans, roasted in the Italian old-style. Your Food experience will end while tasting a yummy gelato in one of the best “homemade” ice cream shops in the city. Despite Florence is quite flat, we suggest you wearing comfortable walking shoes and in case of rain we suggest you bringing an umbrella, since we will be outside for most of the tour. If you have special requests we will do all the necesary to accommodate your group to the best of our ability. Our Private Food Tour lets you unwind while discovering the wonderful flavors of Florence, and you won`t eat anymore for the whole day! A holiday in Milan is incomplete without sampling the mouth-watering cuisine it has to offer. 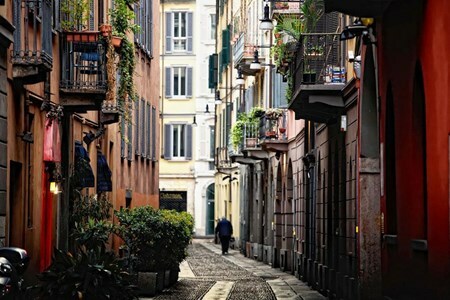 The ideal way to accomplish this is the expansive, 3-hour Food Tour of Brera, which is ... morethe oldest neighborhood in Milan, steeped in history and quaint old world charm! 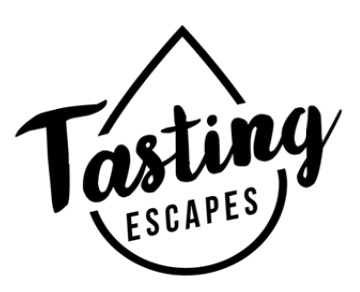 Find local tasting tours & activities . Sort by location, theme, tasting, activity, day, duration, price etc.